This is a concise and easy-to-read guide to the complexities of planning law. Covering the fundamentals of planning law in England and Wales, it analyses the key statutory provisions and relevant case law. 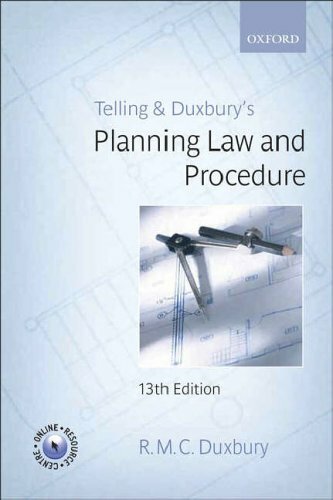 Written in a user-friendly format to guide the reader through this large and complex subject, this book is ideal for students studying courses in law, surveying, town planning, architecture and environmental law, as well as professionals working in planning. A rigorous update ensures that the book remains abreast of the developments heralded by the Planning and Compulsory Purchase Act 2004, with implications for local development, sustainable development, the amendments to Use Classes Order, and on Simplified Planning Zones, along with the abolition of Crown immunity. Robert Duxbury is a Principal Lecturer in Law at Nottingham Law School, Nottingham Trent University. He specializes in planning and environmental law and has published a number of works in this field. He teaches planning law to students of law, surveying and town planning.